More than 100 guests from government, academia and the accounting industry came together to celebrate and honour the new inductees at the tenth Annual Dinner and Awards Ceremony of the Australian Accounting Hall of Fame. The Head of the University of Melbourne Department of Accounting, Matt Pinnuck, was joined by the Directors of the Centre for Accounting and Industry Partnerships - Brad Potter, Stewart Leech and Kevin Stevenson - and the Hall of Fame Director Phill Cobbin. 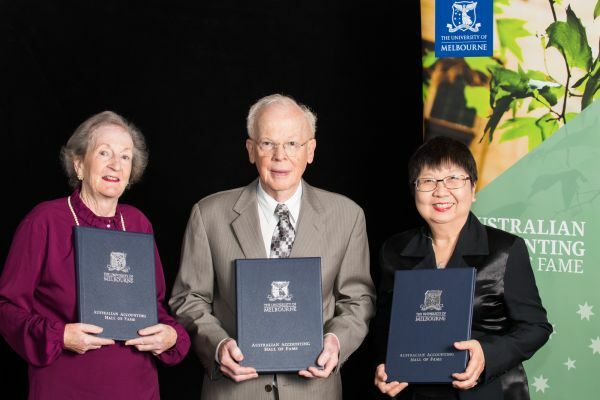 Professor Ray Ball (2018 inductee), Professor Wai Fong Chua and the late Professor Graham Peirson (represented by his wife Christine Peirson) were inducted into the Australian Accounting Hall of Fame on Wednesday 13 March. 2019 inductee Roger Simnett will be formally inducted in 2020. L-R: Christine Peirson, representing Graham Peirson; Ray Ball; Wai Fong Chua. Professor Ray Ball is the Sidney Davidson Distinguished Service Professor of Accounting in the Booth School of Business at the University of Chicago. Ray Ball has worked in Australia at UNSW and Queensland, Rochester and Chicago in the USA and the London Business School. The seminal 1968 paper, “An Empirical Evaluation of Accounting Income Numbers”, co-authored with Philip Brown (AAHoF 2010) and published in the Journal of Accounting Research, is the most highly cited accounting research paper (with 7847 citations, Google Scholar). This paper marked the beginning of Ray’s considerable influence on the literature and the accounting research community. For personal reasons, Ray Ball was not able to make the trip to Melbourne in 2018. He was formally inducted at the 2019 ceremony as a 2018 member. Professor Graham Peirson was an academic at Monash University from the mid-1960s until retirement in 2002 when he was appointed Emeritus Professor. A graduate of The University of Adelaide, he held visiting appointments at the University of California - Berkeley; University of Illinois; University of Florida and the University of Washington. Graham taught and researched financial accounting and reporting with a focus on issues relating to accounting standard setting and the regulation of financial reporting. The Hall mourns the loss of Graham, who passed away in early 2019 at the age of 80. A lifetime of achievements and important contributions to accounting were celebrated with his induction, where Graham was represented by his wife Christine. Professor Wai Fong Chua AM has built an international reputation as an innovative and prolific accounting researcher following undergraduate and doctoral studies at the University of Sheffield. Focussing on understanding how accounting operates as a ‘socio-technical’ technology she has conducted studies on accounting issues from the management of strategic supply chains in the private sector, to the use of public-private-partnerships for infrastructure development and the implementation of DRG costing in Australian hospitals. Her work demonstrates how accounting changes social routines and patterns of meaning in organisations. Wai Fong has published consistently in top journals and continues to attract significant competitive grant funding. The Australian Accounting Hall of Fame acknowledges and thanks our valued sponsors, CPA Australia and Chartered Accountants Australia & New Zealand, whose generous support makes this prestigious event possible. Nominations for next year's Australian Accounting Hall of Fame awards will be open on 1 June 2019.